How x-treme? It comes with its own case. The Miller Spectrum 375 X-Treme sports 30 Amps for 3/8 in. mild steel capacity, XT30 torch with ergonomic handle and flexible cable, Auto-Line and MVP Plugs make this 19 lb unit the most portable plasma cutting system in the market! Auto-Line provides state-of-the-art flexibility to the end user. The Auto-Line circuitry automatically connects to 120–240 VAC, single-phase power, 50/60 Hz, without removing the covers to relink the power source. Miller’s multi-voltage plug (MVP) allows connection to 120 or 240 V receptacles without tools—choose the plug that fits the receptacle and connect it to the power cord. Portable in the shop or at the job site—at 19 lb the shoulder strap allows the end user to easily move from location to location. Wind Tunnel Technology - internal air flow that protects electrical components and PC boards from dirt, dust, debris:greatly improving reliability. Fan-On-Demand cooling system only operates when needed. In dirty or dusty environments, this feature reduces the amount of airborne dust/dirt pulled through the unit. 5 stars - "A great machine" nohandle Do not let the small size fool you! 5 stars - "Works Great!" Bob_F This is my first plasma cutter, so I don't really have anything to compare it to; but I am really impressed! It's the size of a toaster (four slice), and it cuts through 1/4" steel like a hot knife through butter. It's much easier, faster, more accurate, and leaves a better finish than the oxygen/acetylene torch that I have been using for such cutting projects. This was my first purchase from IOC. They have great prices and great service. IOC is now my supplier of choice! Thanks IOC!!! 5 stars - "Couldn't be happier with the plasma cutter" James First plasma cutter and I don't think I'll need another one. It compliments my auto set Miller MIG welder perfectly. Great quality at a great price. Fast delivery too. Simple transaction and fast. 5 stars - "I Love this Thing!" Mike B I purchased this plasma cutter a few weeks ago and have used it in several different projects so far. This thing is worth the money. It has given me so many more options in my furniture building hobby. You can cut in so many ways and have so many options. Using a straight edge, it makes a super smooth cut with ease. I even let my buddy try it as he'd never used one before. From the start he was making some amazing cuts using a straight edge. This is a must have if you do a decent amount of work with metal. Also, this transaction was quick and easy and it shipped really quick. 5 stars - "good" jimbo Out of the box, ready to use. 5 stars - "Hooked On Blue" 5 acre auto Once your over the sticker shock and buy one of these you'll realize how amazing it is. I have been using the 375 X-treme for weeks now and it has surpassed my expectations, the speed, the accuracy, the ability. This makes the most difficult situations complete in seconds. The 375 X-treme comes with 2 types of tips, the drag tip and the deflector tip. These parts and the consumables last a very long time. There is an air filter in the unit that should be listed as a consumable also. Buy Miller so you can have easy access to parts for years to come unlike the cheaper temptations. This cutter is only limited by your imagination so plan on having fun. 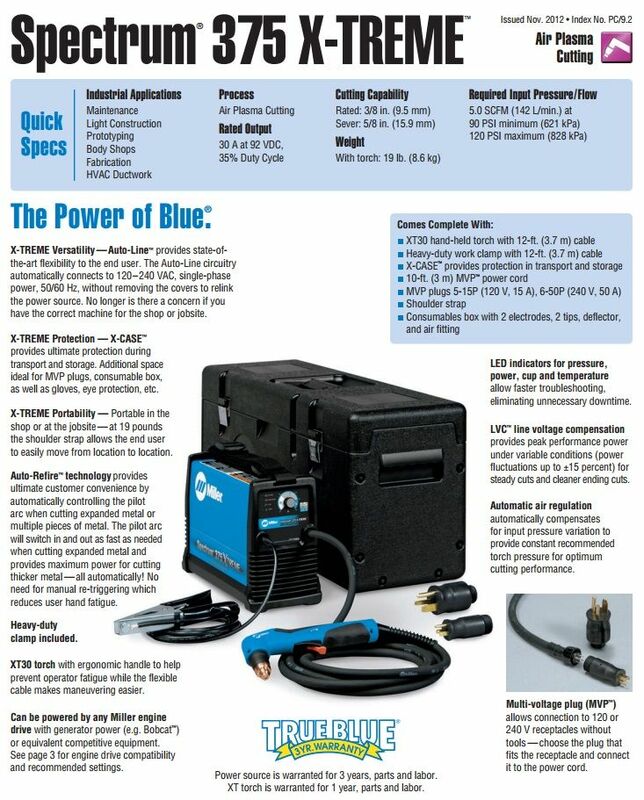 5 stars - "Miller Spectrum 375 x-treme plasma cutter" PAUL B. Works great,everything you expect from a miller. 5 stars - "I only shop at IOC!!!!" Ronald G. The reason I only shop here is first you have peace of mind that order is well taken care of!! Second the prices are much cheaper than the rest!! I will only deal w IOC for my welding needs!!! 4 stars - "A lot harder to use" Dustin L. A lot harder to use than adverised but it is well built and is a quality product. I will have to learn a lt to use it well. 4 stars - "Great buy" Steven E. Found this to be a great price & shipped quickly. Will buy from here again. 5 stars - "Miller 375 x-treme" Guest Very happy I made the choice to go with Miller. I haven't had a chance to put it thru a day of cutting but it did fantastic on some scrap plate and some aluminum. Very happy with it. 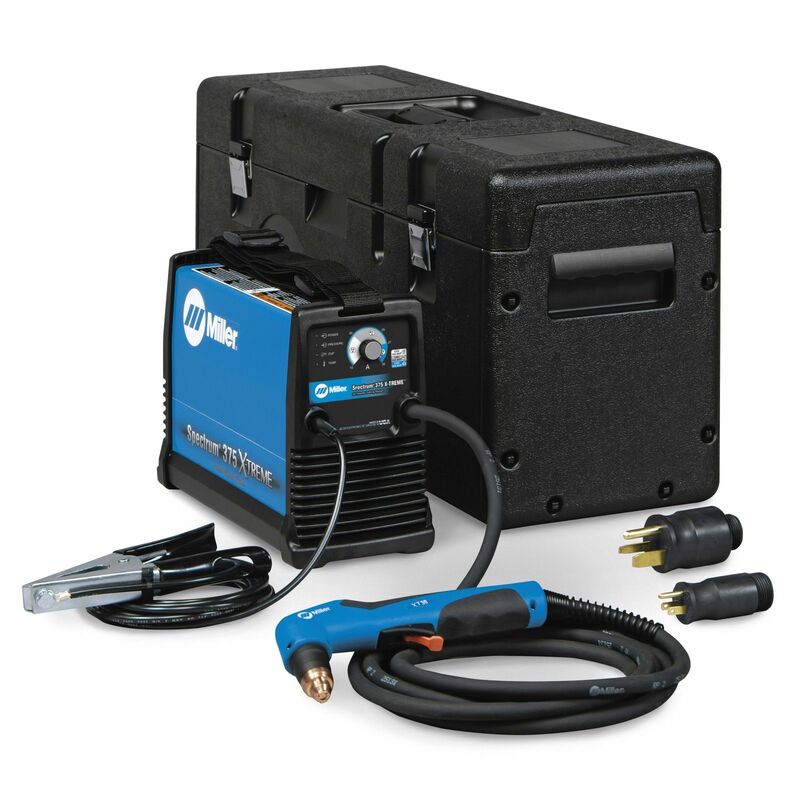 5 stars - "Miller Spectrum 375 X-Treme Plasma Cutter" C.R. M. Called with a couple questions , customer service was Great ! Placed my order online and was on my door step 3 days later to central Fl. I have seen comments about the carry box being a tight fit on the power cord . Box is more than big enough , the molded in detente in the floor of the box makes the cord tight against the end of the box but there is all kinds of room to slide the unit back and avoid any problems packing it up for travel. And just for the record I made a very clean cut on a 3/4 " bolt on 230v . I think it will cut even more. Glad I chose to buy a new Miller Thanks !!! 5 stars - "????" Guest ???? 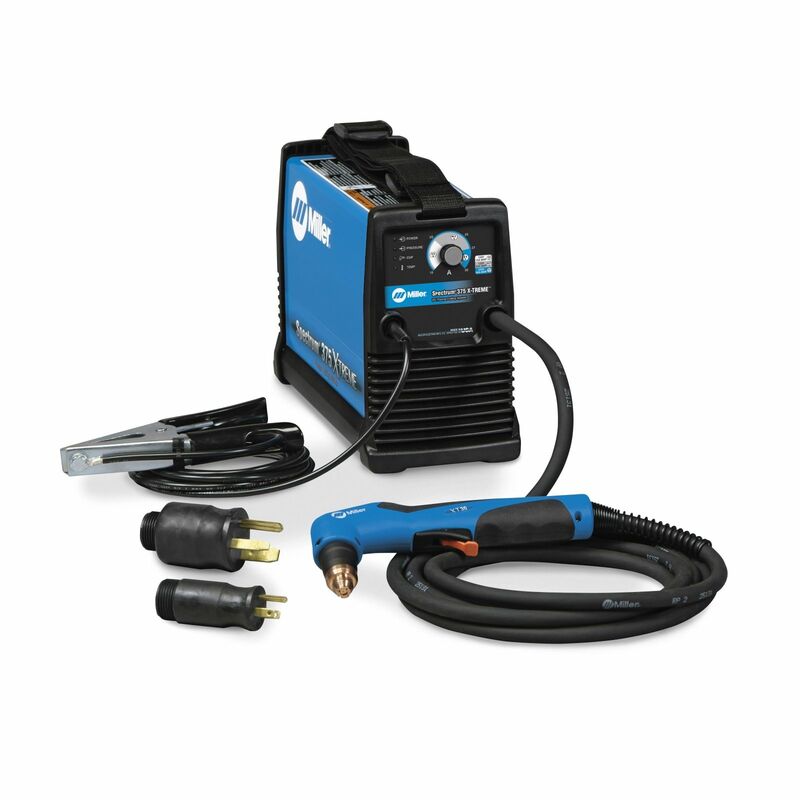 5 stars - "Great seller" Joe B. I have bought a couple of welding units from this company and Nathan has been the best! Customer service is awesome and the tools work great No need to shop anywhere else , great prices too! 5 stars - "love it." Pierre R. Easy, small, powerfull, smooth, fast.